'Cue Man: Chef Chris Lilly of North Carolina's Big Bob Gibson Bar-B-Q, Grand Champion of the 2014 World Championship Barbecue Cooking Contest. Photo from WCBCC Facebook page. EVER wonder what makes barbecue barbecue? Of course not! It tastes good and that is all that matters. Let someone else ponder the whys and whyfors. Incidentally, May is National Barbecue Month. Unofficially, so are June, July, August and September. For the most devoted, October, too. 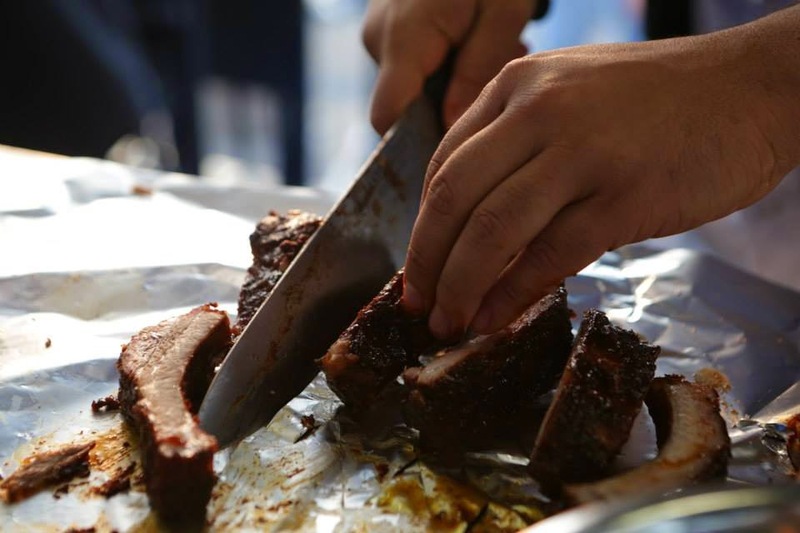 The official month, though, is a period during which festivals abound, including the World Championship Barbecue Cooking Contest in Memphis. A body who knows about the essence of barbecue is food scientist Guy Crosby, a guy with a lot of capital letters behind his name. GC took questions from Institute of Food Technologists staff ahead of the IFT14 Annual Meeting and Food Expo in New Orleans last month on the very subject of barbecueology. GC explains how meat takes on wood flavor. He also speaks calmly about the Maillard Reaction, as well as other barbecue business. (See video above). There's a sure method to making and keeping barbecue meat moist. Photo from WCBCC Facebook page. Q. How does using a marinade make meat more tender? A. There are some misconceptions around this topic, typically only salt or salty ingredients such as soy sauce make the biggest difference. It really depends on the type of meat and the muscle structure. The protein that forms when the salt breaks the muscle down helps to retain moisture, and makes the tissue a little looser. Acid-based marinades such as lime, lemon juice or vinegar don’t have a huge effect. They will help break down some connective tissue and flavor the meat, but it’s really only on the surface. Q. Does searing a meat before cooking help keep the juices inside? A. Searing does not trap or keep moisture inside a piece of meat; it’s an old kitchen myth. Corn on the cob, baked beans and cole slaw on or off sandwich are nice complements to barbecue. 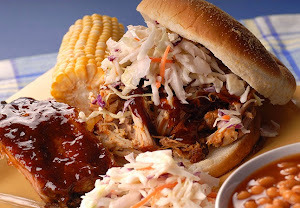 Photo from National Barbecue Association Web site. Q. Why does a piece of meat need to rest before cutting it? A. When you cook meat the muscle fibers and the proteins begin to shrink and squeeze out moisture. If you immediately slice a piece of meat, the moisture that has been squeezed out of the muscle fibers will run out. But if you let it sit for 15 to 20 minutes depending on the size and thickness of the meat, the fibers start to soak back up some of that moisture. Q. What is the Maillard Reaction? A. A French scientist in 1912 discovered certain proteins and amino acids react with certain kinds of sugars and cause browning. When meat is browned it forms hundreds of very potent flavor molecules that affect its aroma and taste. 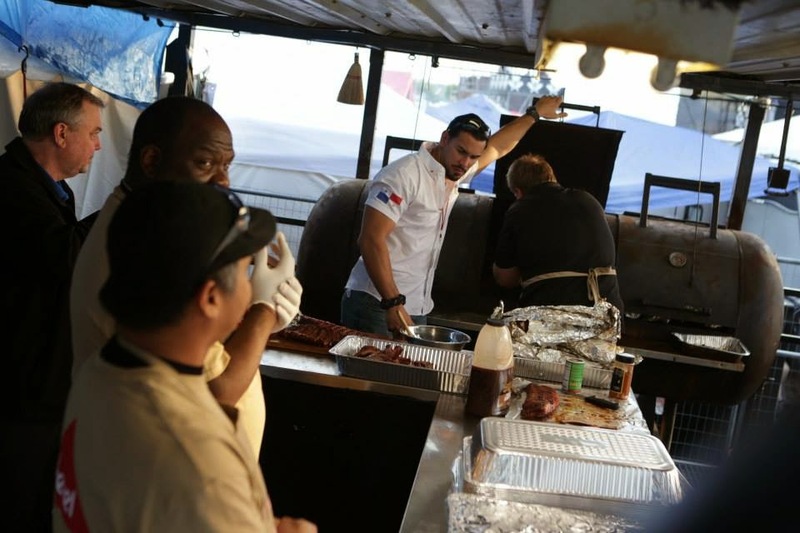 Doing prep work at the 2014 World Championship Barbecue Cooking Contest. Photo from WCBCC Facebook page. Q. When smoking a piece of meat, how does the wood flavor get infused into it? A. The oxygen breaks down the lignin in wood and releases a smoky aroma that sticks to the moist surface of the meat, flavoring it. Q. What is an easy thickening agent to use at home to thicken a barbecue sauce? A. The most common one would be cornstarch. The best way is to add cornstarch to room temperature water first, mix well, and then add the combination to the sauce and heat. Flour is another option. Making it saucy. Photo from WCBCC Facebook page. Q. Why cook low and slow? A. The lower you cook the temperature, the less the fibers will shrink, the less tough the meat will be because it won’t lose as much moisture. Typically tough cuts of meat are cooked this way to keep the meat moist. Cooking the meat slowly breaks down tough connective tissue to form gelatin, which binds moisture. The amount of fat also helps because it breaks up the protein, lubricates the meat and makes it tenderer. There it is, the makings of barbecue. Visit http://www.ift.org/ to learn more about the Institute of Food Technologists. Visit http://www.nbbqa.org/ to learn more about the National Barbecue Association (NBBQ). Visit http://www.memphisinmay.org/worldchampionshipbbqcontest to learn more about the World Championship Barbecue Cooking Contest. 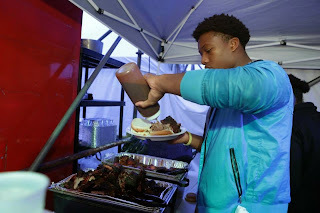 Visit http://www.bigbobgibson.com/ to learn more about Big Bob Gibson Bar-B-Q.